Find peace with calming Krylon® colors and sheens in a meditation space! If the cabinet doors are raw wood, using Krylon® ColorMaster Primer – 25% More will help to seal the wood. Spray one side of the cabinet doors with two coats of primer, and once fully dry, turn over and spray the other side of the cabinet drawers with two coats of the primer. Use Krylon® ColorMaster Paint + Primer – 25% More in Satin Jade to paint the back side of all cabinet doors (the back sides will be used to create the underside of the standing shelf, giving the shelf a two-tone finish). Use three coats to achieve the pictured look. Once the back sides of the cabinet doors are completely dry, turn them over and paint the top side of the cabinet doors with Krylon® ColorMaster Paint + Primer – 25% More with Satin Oxford Blue. Use three coats to achieve the pictured look. After the paint is fully dried, gather the cabinet doors and two brackets from a 2x4. Measure the centerline of two of the matching doors that will serve as the standing sides of the shelf. The wood brackets are the support structure for the shelf. All of the cabinet doors will be attached to one of them before the project is complete. Use pocket holes for the 4 cabinet doors that will create the top panel and the two side panels. First, drill pilot holes, using an impact driver. Then drive the fasteners in the pilot holes (double-check the screw length to be sure that the screw does not pop through the front of the cabinet doors). After the bracket is secured to the side panel, attach the bracket to the long, rectangular cabinet door, which will serve as the support for the top panels. Repeat the process for the other side, and then attach each of the smaller cabinet doors to the bracket, using the same pocket hole/pilot hole method used for the side panels. Now that the bench is complete, add metallic accents! Spray décor items for the top of the meditation bench using to add that touch of shine with Krylon® ColorMaster Paint + Primer Metallic – 25% More in Metallic Brilliant Gold. 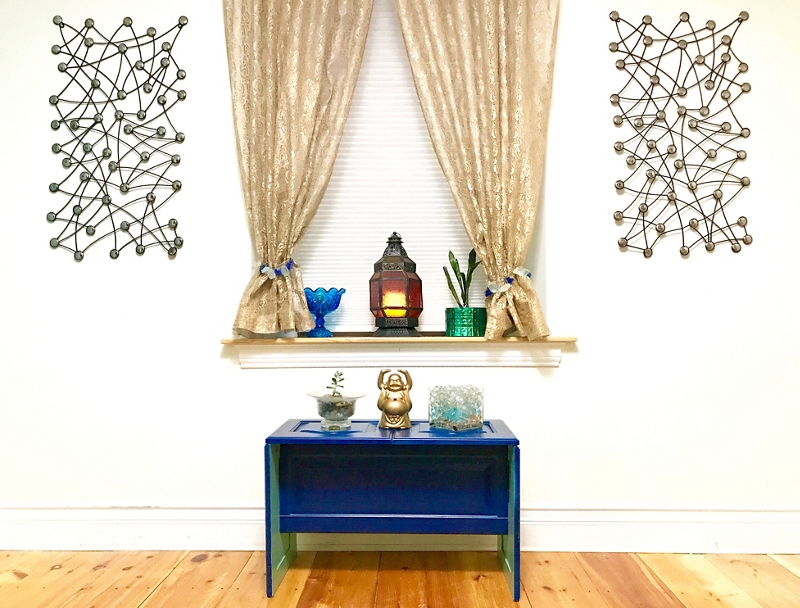 If your meditation shelf is below a window, use Krylon® ColorMaster Paint + Primer Metallic – 25% More in Metallic Brilliant Gold to paint a curtain rod. For an added touch of metallic, paint white lacey curtains with Krylon® ColorMaster Paint + Primer Metallic – 25% More in Metallic Brilliant Gold.